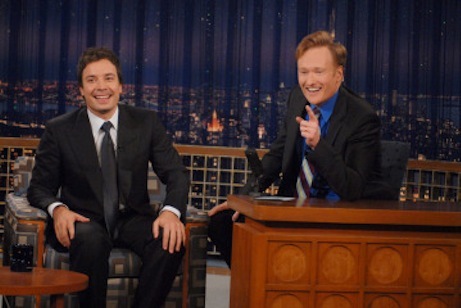 Jimmy Fallon soon will be on the right-hand side of home screens. Conan O'Brien will spend close to three-and-half months prepping for his new hosting duties on The Tonight Show, NBC announced Thursday. O'Brien will leave the network's Late Night on Feb. 20th, with new host Jimmy Fallon stepping in on March 2nd. As previously announced, O'Brien is set to succeed Jay Leno on June 1st. Leno then will move to prime-time next fall with a Monday-Friday show at 9 p.m. (central). Fallon is still video-blogging in preparation for succeeding O'Brien, who has been hosting Late Night since Sept. 13, 1993. David Letterman originated NBC's Late Night franchise on Feb. 2, 1982. Letterman jumped to CBS in 1993 after NBC chose Leno instead of him to succeed the late Johnny Carson as Tonight Show host. ***The Office, 30 Rock and The Biggest Loser all have been renewed for next season, NBC says. ***The Peacock also has announced air dates for several new spring series, including Amy Poehler's post-Saturday Night Live sitcom. Poehler will play a mid-level, Pawnee, Indiana government bureaucrat named Leslie Knope in a series that otherwise has no name yet. It's scheduled to premiere on Thursday, April 9th at 7:30 p.m. (central) in the slot now occupied by Kath & Kim. Rashida Jones (The Office) co-stars as a nurse. Southland, a new police drama from ER maestro John Wells, also will premiere on April 9th -- in ER's 9 p.m. slot. Its stars include former O.C. heartthrob Benjamin McKenzie as a rookie cop under the wing of a prototypically hard-driving, no-nonsense taskmaster played by Michael Kuditz (A River Runs Through It). Three extra episodes of ER have been ordered, moving its series finale back to April 2nd. The Chopping Block, a daintily titled new cooking competition, will move to NBC's front burner on Wednesday, March 11th at 7 p.m. Demanding chef/restaurateur Marco Pierre White rides herd, with the winning team getting $250 grand and probably heart burn. NBC's previously announced Kings, initially set to premiere on Thursday, March 19th, instead will launch on Sunday, March 15th at 7 p.m. Ian McShane of Deadwood fame stars in what the Peacock describes as "an epic story of greed and power, war and romance, forbidden loves and secret alliances." ***Rival networks waiting for Fox's American Idol to draw its last breath might want to keep playing taps for themselves instead. National Nielsens for Season 8's Tuesday-Wednesday launch were down a bit from the previous year's, but not enough to matter all that much. Tuesday's two-hour dose had 30.4 million viewers, a drop from 33.4 million a year ago. But Wednesday's second two-hour Idol held serve with 30.3 million viewers, just a wee drop from the 30.5 million who watched Night 2's auditions from Dallas last January.